We always need beautiful moments in our lives, especially on special days like tomorrow. But often, our lives are so full of regular, old boring stuff, it’s hard to fit the “pretty” in. So here’s my Valentine tip for you: Everything looks better by candlelight. Have you been there? I know you have. But I made the discovery that night that everything looks better by candlelight. I don’t just mean that it makes lovely things look better, like a romantic dinner, or a warm tub full of rose petals, or a glittering evening wedding. I mean everything. Laundry. English peas on your kid’s plates. Crow’s feet and grown-out roots. Spots on the carpet, the pile of junk at the end of the table, and the stack of bills under the pile of junk at the end of the table. Your four-year-old who chose to come to dinner in his underwear. Paper plates. Your husband’s favorite plaid shirt. But the real beauty of this is that it allows you to make a special ocassion out of any day, whether circumstances are perfect, or not. Tomorrow, on Valentine’s Day – or anytime you need something special – enjoy your regular life by candlelight. You’re so Cute, Smart and Organized! Great idea. 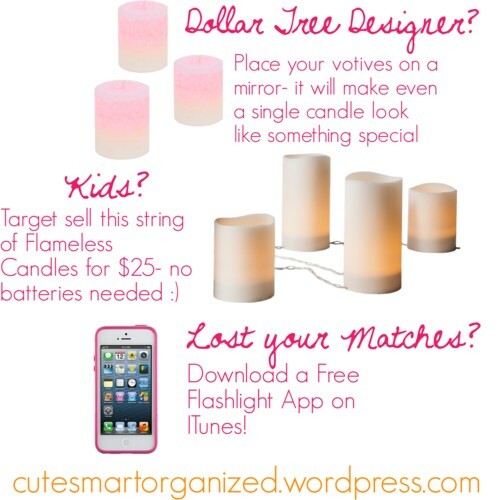 I think I will do a fancy table tomorrow night…even candlelight! (and even with the kids there!) thanks! Thanks, Janet! You’re sweet – y’all have fun!